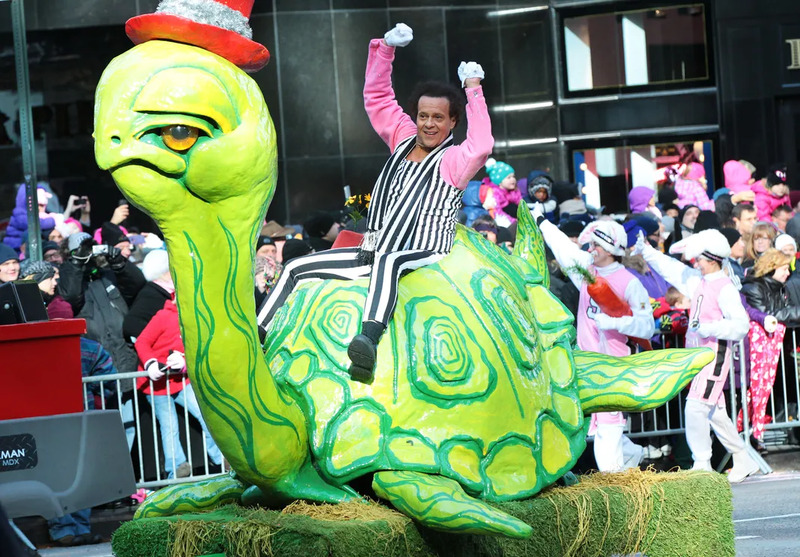 Richard Simmons rode in the 2013 Macy's Thanksgiving Day Parade in New York City on November 28th. For a reason that we're still unsure of, he was sporting the awfully memorable white and black striped, Beetlejuice inspired outfit. And he was on a turtle. And it's Richard Simmons. Everything about this situation is pretty perfect, and judging by the turtles expression, we were all thankful for this ball of energy on our Thanksgiving. Singer Gwen Stefani and her family arrived at her parents house for Thanksgiving Day in Los Feliz, Los Angeles on November 28th. She even brought along her puppy who was really rocking the cone look. But we love the coordination of red within these two. Also, we keep forgetting that she's pregnant! She looks almost too good to be. We envy you Gwen. Singer Max George from the UK band The Wanted, said farewell to his girlfriend Nina Agdal at the Barbados Airport on November 30th. The couple was spotted spending time together on boats, the beach, and all the places we wish we were instead of in this cold, winter weather of NYC. After spending a long and relaxing vacation together, it was finally time for the lovebirds to part ways. Till next time..
Actress and Singer Bella Thorne handed out dinners to the homeless for Thanksgiving at the Los Angeles Mission on Skid Row in Los Angeles on November 28th. Alongside other well-known celebs like Neil Patrick Harris, Bella showed other kids her age that there's no time too early to start helping others in need. Side note: those mashed potatoes look pretty yummy. 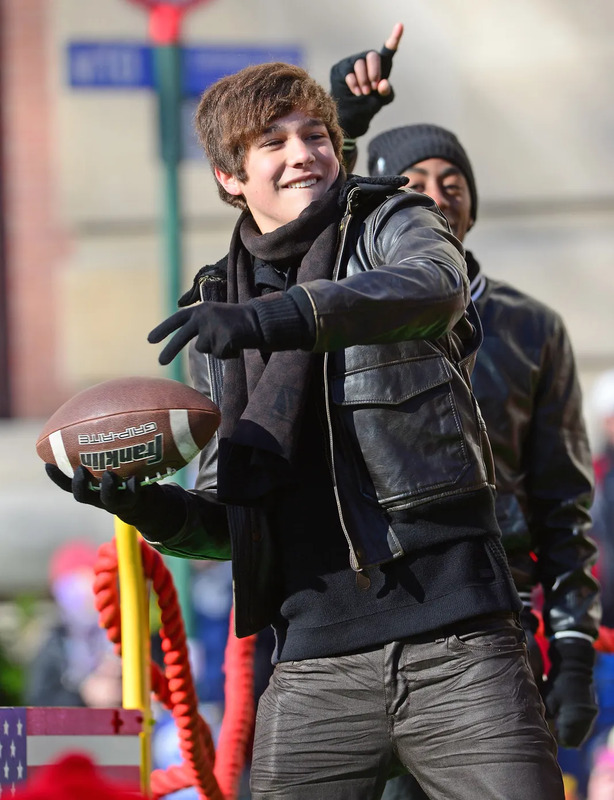 Singer Austin Mahone performed at the 2013 Macy's Thanksgiving Day Parade in New York City on November 28th. The Banga, Banga singer was even throwing passes with some onlookers. Being his first time in this parade, we're sure he was nervous, but he's pretty good at hiding it with that adorable smile of his. 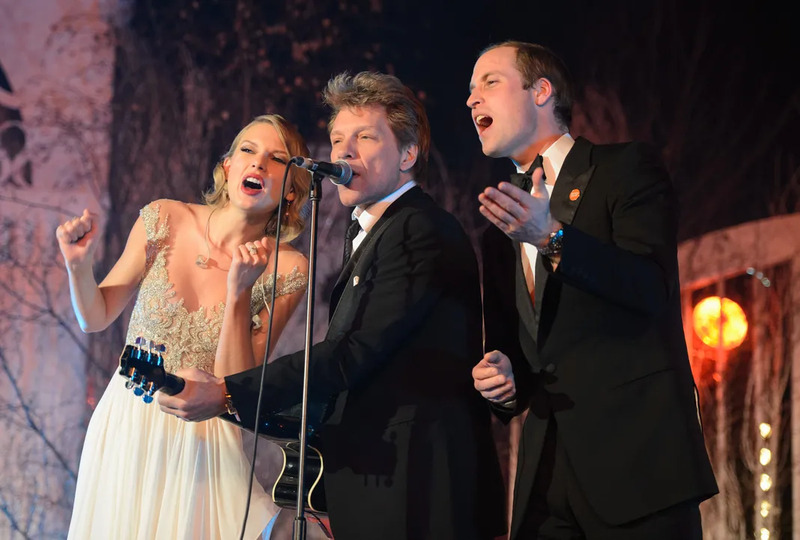 Prince William joined singers Taylor Swift and Jon Bon Jovi on stage at the Centrepoint Gala Dinner in London on November 26th. The trio did a rendition of Livin' on a Prayer, all very much into the performance. Who would've thought this collaboration would ever happen? We didn't... but we like it. Converting to a New Yorker? 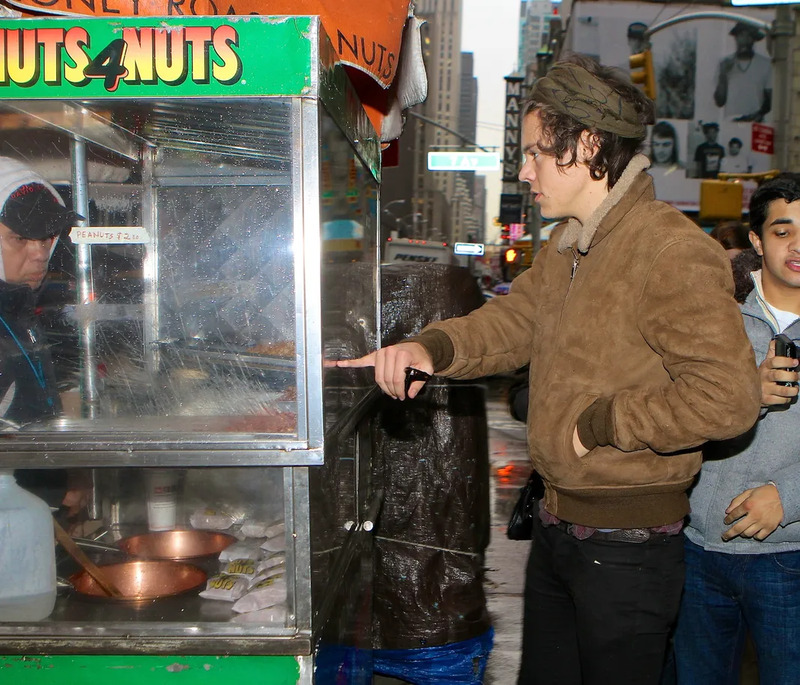 Singer and 1/5th of the dreamy boyband One Direction, Harry Styles, stopped in Times Square on November 26th. After performing at Good Morning America in Central Park with the 4 other British/Irish studs, Harry was roaming around the city afterwards, and getting swarmed by fans. Honestly, we probably (most definitely) would've been out there with them, but we had to be adults and work. Now our man is back in London and we want to cry. COME BACK TO US HARRY! Actor John Stamos was spotted leaving his hotel in New York City on November 26th. He attempted to avoid being recognized by dressing in a not-so fashionable way. The reason? Our favorites, One Direction, were staying in the same hotel, so it was obviously mobbed with screaming (mostly) girls. Those screams soon turned to "UNCLE JESSE!" screams, so John happily waved and gave thumbs up to the crowd. What a hunk. 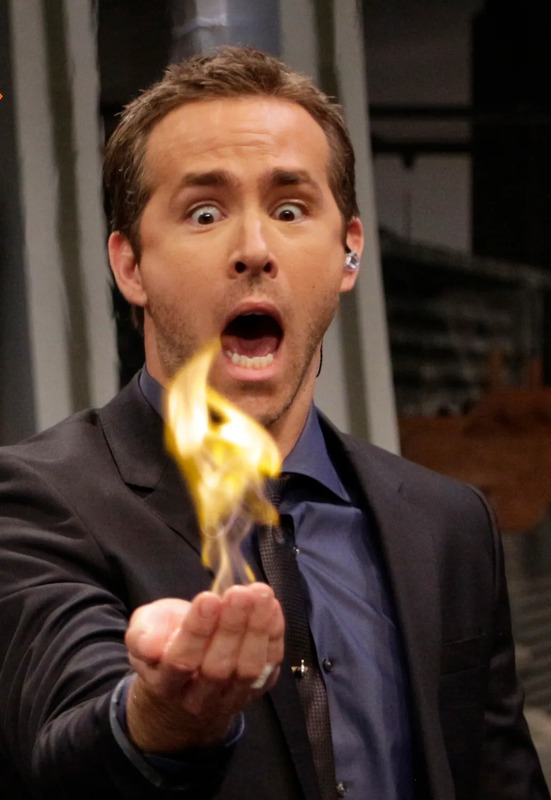 Actor Ryan Reynolds was on the always entertaining Spanish TV show 'El Hormiguero in Madrid, Spain on November 26th. Casually hanging out with his hand on fire, we never truly understand this show, but appearances on it always make for good photos. His face is beautifully dramatic. Santa (and Ariana) are coming to town! Singer Ariana Grande and Santa Claus visited the Empire State Building in New York City in honor of Macy's Thanksgiving Parade on November 25th. They hung out in both the lobby and out on the top decks. Seeing this gets us so excited at the thought that the holidays are literally right around the corner! December in the city is the absolute best (minus the cold)! 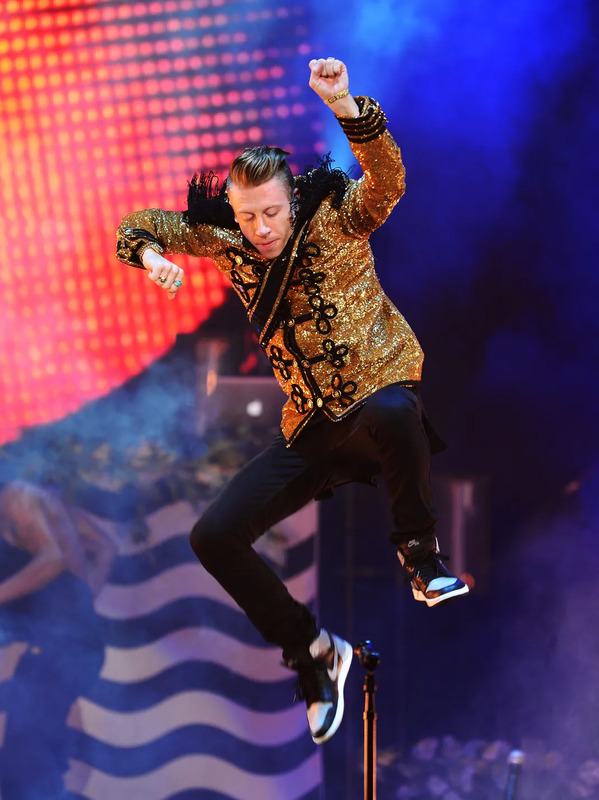 Singer Macklemore & Ryan Lewis performed live at American Airlines Arena, which was broadcasted as a live feed for the 2013 American Music Awards in Miami on November 24th. The Can't Hold Us singer was stage-diving and all. He basically wasn't standing still at any point, but that's kind of why we love him so much. Singer Lady Gaga dressed in an all black, not-so comfortable looking outfit at LAX in Los Angeles on November 25th. She was with her entourage boarding a flight to Tokyo to promote her new album ARTPOP. We're still trying to figure out how she got through security in that thing, or if there was a pat-down. We would've liked to witness that. Singer Miley Cyrus arrived in a low cut white blazer and pants for the 2013 American Music Awards at the Nokia Theater in Los Angeles on November 24th. After turning 21 years young on the 23rd, she is starting it off right. She closed the show with her performance of Wrecking Ball, which highlighted her vocals rather than her dance moves. Good move girl, you're the best. 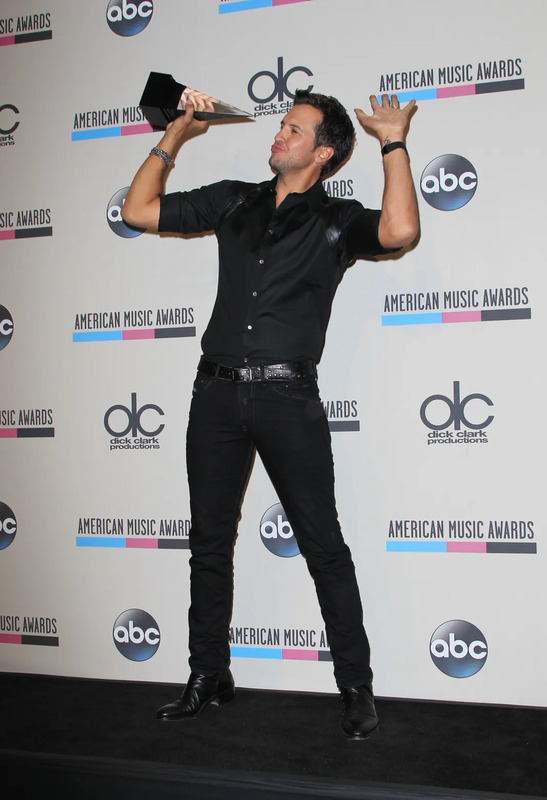 Singer Luke Bryan after the 2013 American Music Awards in Los Angeles on November 24th. He took away the award for Best Country Artist, as well as performing one of his chart toppers. He also did his famous body-roll dance moves. And we may have been screaming while witnessing it. We could watch you dance for days Luke. Not ashamed. 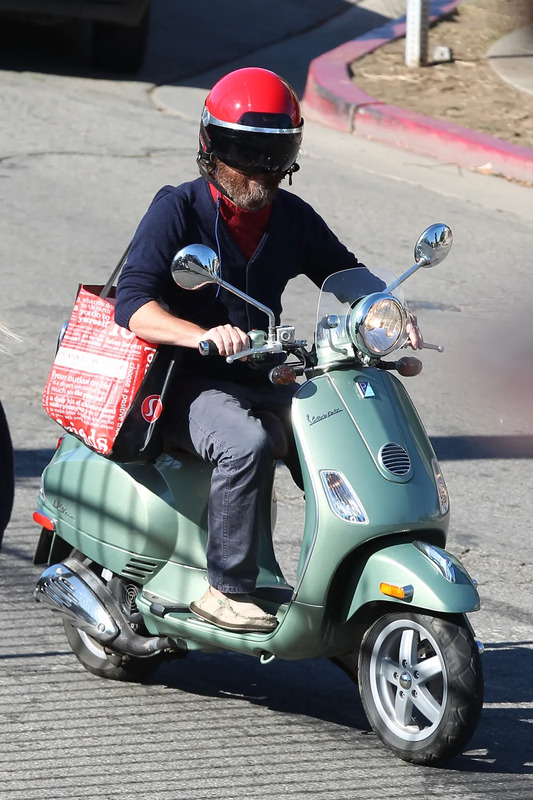 Actor Zach Galifianakis rode his Vespa Scooter in Venice, California on November 24th. Although you wouldn't know it's him just by this photo, are you really surprised by this? We especially love the Lululemon bag. We wonder what goodies are inside. 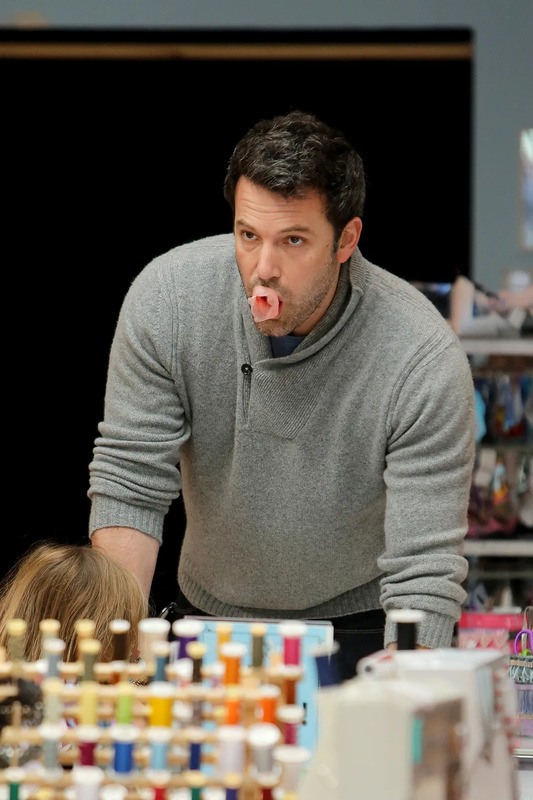 Actor Ben Affleck blew some bubbles with his gum as he took his daughters out and about on November 24th in Los Angeles. We're huge fans of either photos that include amazing illusions, or perfect timing. This is a prime example of that. It just looks hilarious. Singer Jessica Simpson, and sister Ashlee Simpson, get animated with the crowd as they sign photos for fans in Dallas on November 23rd. We still aren't quite sure what got this reaction out of Jessica, but she looks cute while doing it so that's all that matters. Ellen DeGeneres announced Duracell Power a Smile campaign for Toys for Tots at Van Nuys Airport in California on November 22nd. 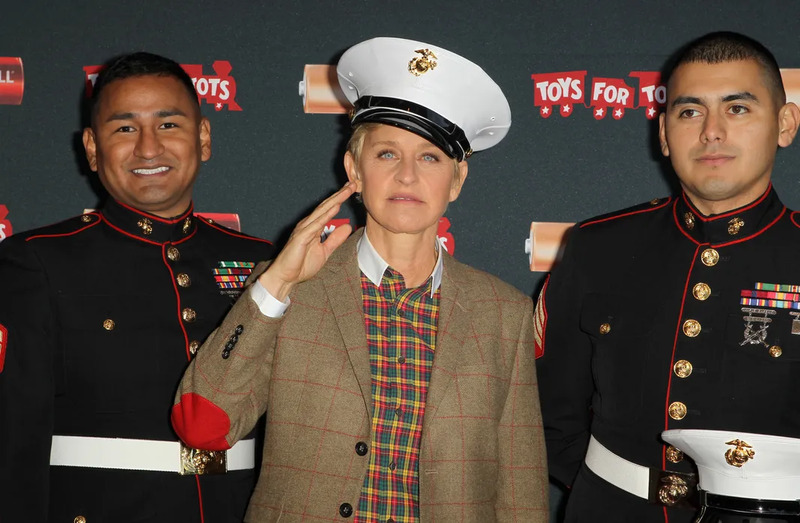 Alongside Marines, we salute YOU Ellen. Jennifer Lawrence arrived at the Good Morning America studios on November 21st in New York City. While meeting fans outside, something terrible was either said or appeared for this look to happen. We don't think it's the Cheez-Its because really those are one of the best snacks in the world, so why the face JLaw? Go Katniss! 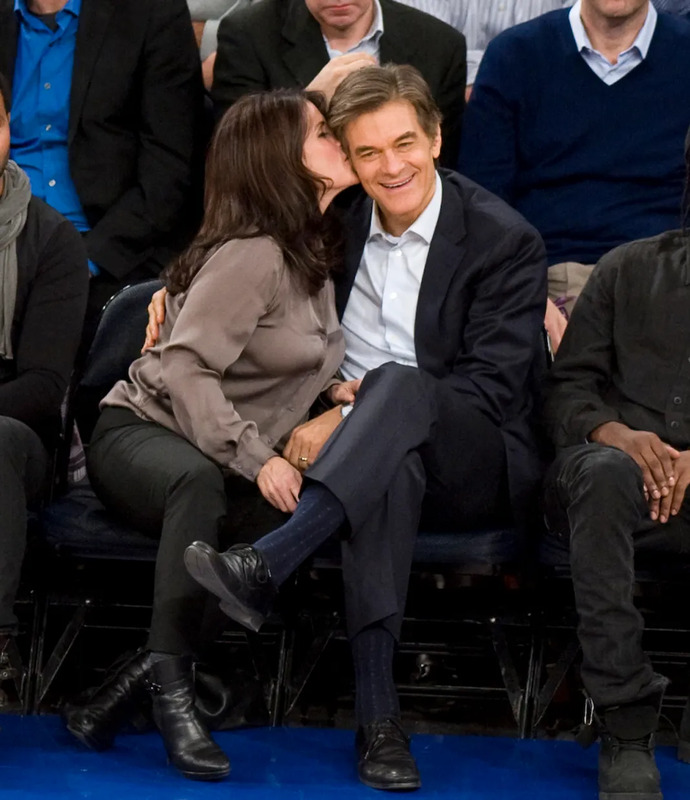 Doctor Oz got awful cozy with his wife Lisa at the New York Knicks game on November 21st in New York City. Whether this was for the 'kissing cam' or not, he certainly seems to be enjoying it. Like really, really enjoying it. 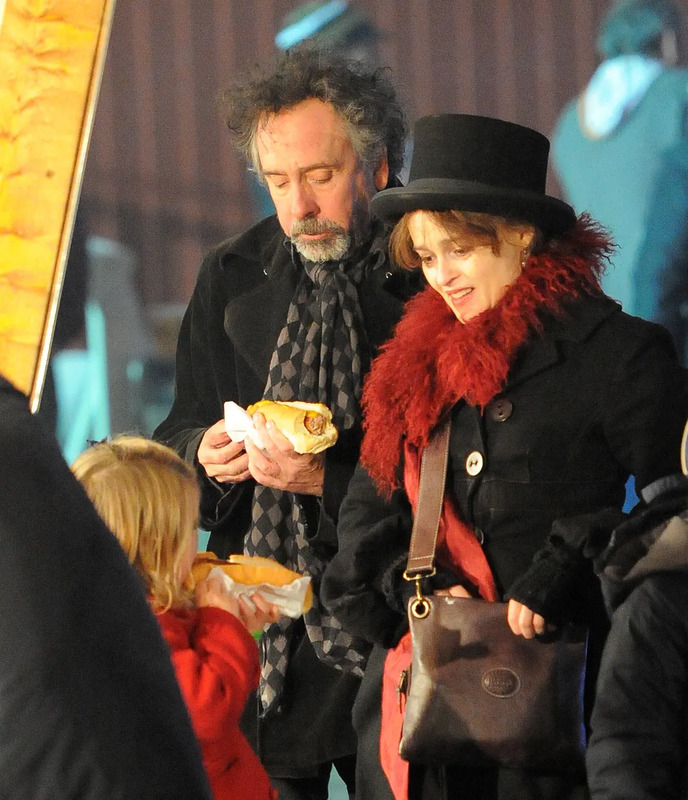 Director Tim Burton and Actress Helena Bonham Carter enjoyed an evening at the opening of Winter Wonderland on November 21st in Hyde Park, London. It's strange to see them, especially Helena, out of her characters. 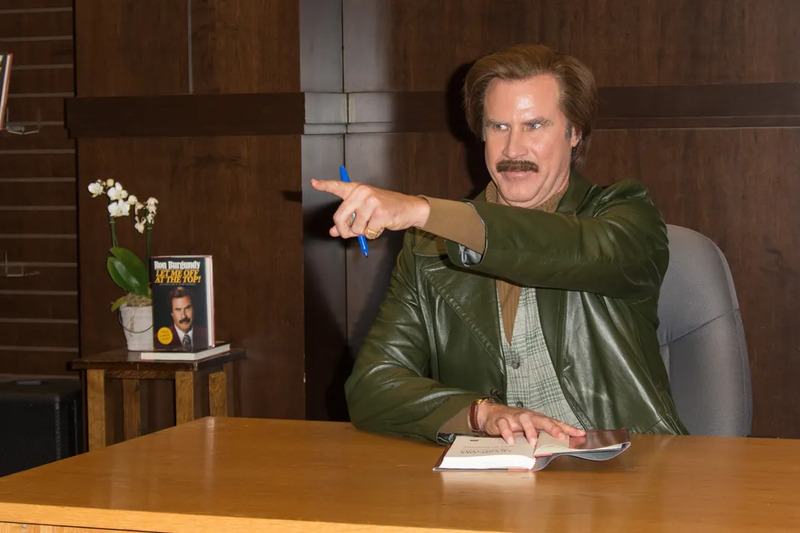 Also, that hotdog is looking pretty good..
World renowned news anchor Ron Burgundy (aka: awesome actor Will Ferrell) at his book signing for Let Me Off At The Top held at Barnes & Noble on November 20th in Los Angeles. We just love everything about this photograph and Ron/Will. We can't wait for the release of Anchorman 2! TV personality Maria Menounos read People Magazine's Sexiest Man Alive issue on the set of Extra at Universal Studios on November 20th. We can't blame her. That's our favorite issue of the year. In fact, we're already looking forward to next years! 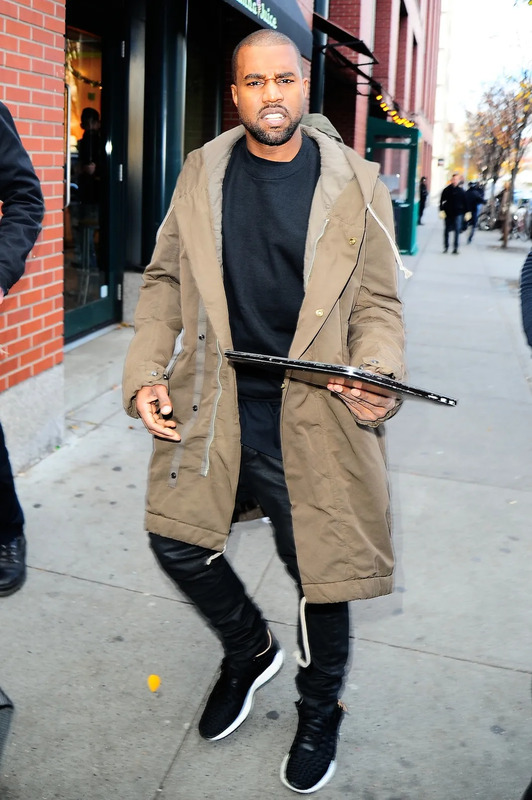 Rapper Kanye West took a stroll in SoHo, New York City on November 19th while attacked by paparazzi. In town for a handful of shows for his Yeezus Tour, it's pretty clear that he's annoyed about all the attention he's receiving. But his face is kind of priceless. Much love Yeezy. 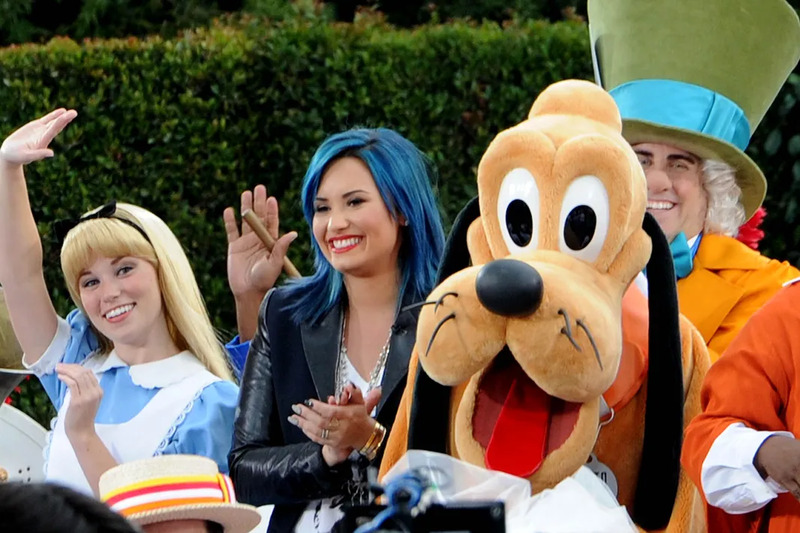 Singer Demi Lovato met Pluto, Alice and the Mad Hatter when she was co-hosting The View on November 19th at Disneyland. Rocking her blue hair, which we are still in love with, she promoted the release of her new book, Staying Strong, as well as showing off her comedic side. She's just so cute. Comedian and Late Night host Jimmy Fallon, and his band The Roots shot a segment in front of the NBC Studios in New York City on November 19th. Rocking the air guitar, Jimmy was surrounded by women in bikinis and he looks pretty excited about it. Actress January Jones took her son Xander to his baby class in Los Angeles on November 19th. As they were leaving, the duo sported sunglasses and Xander even had his whole 'model face' down. January, looks like you've got a future star in your hands... Literally. Actress Nicollette Sheridan showing Extra host, Mario Lopez, how to Ballet dance while recording at Universal Studios in Los Angeles on November 19th. We gotta admit, Mario's technique is pretty legit. Straight knees and pointed toes, he was totally a ballerina in a past life. Actor Sam Claflin grabbed onto a fans sign at the Hunger Games: Catching Fire premiere at the Nokia Theater in Los Angeles on November 18th. 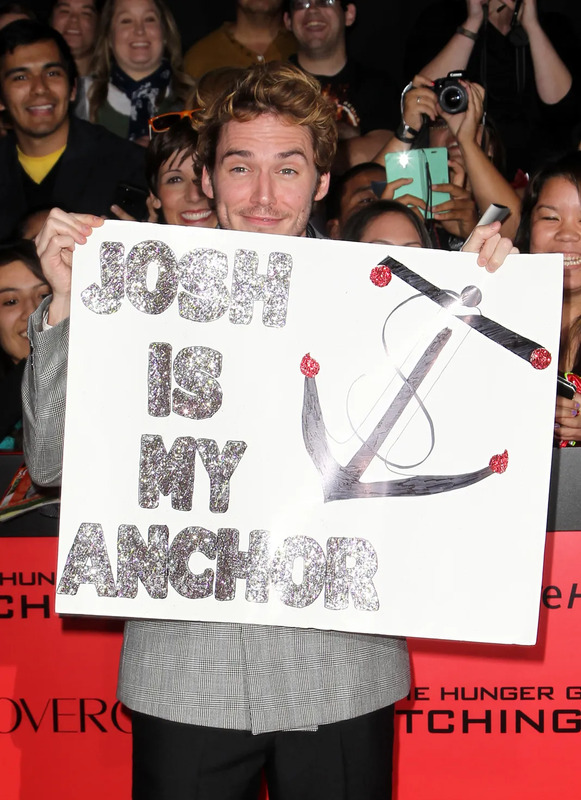 His sign or not, we're sure he still considers Josh Hutcherson his anchor. So romantic. 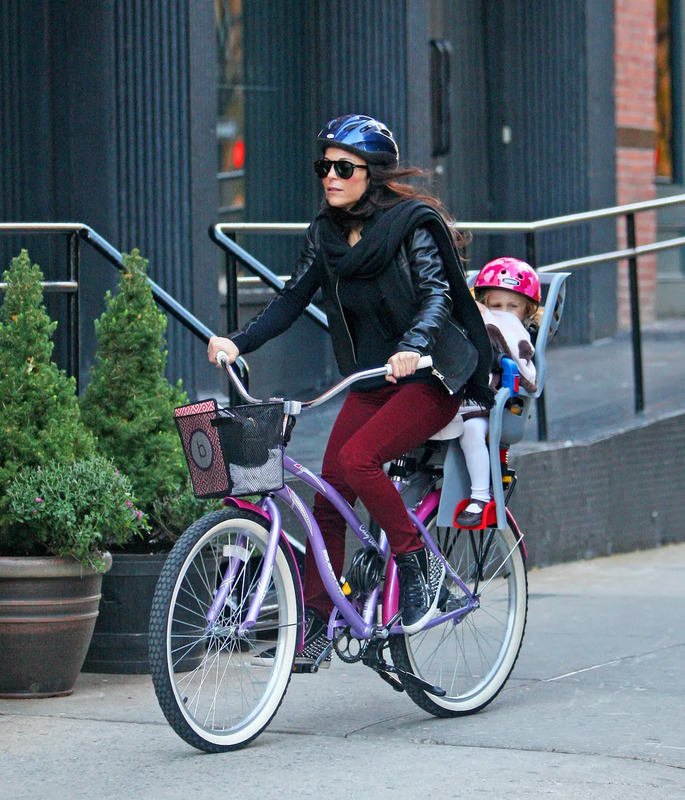 TV personality Bethenny Frankel took her daughter Bryn Hoppy for a ride in New York City on November 18th. The reality star was seen picking her daughter up from school, greeting her with a big kiss, strapped her onto her bike chair and then went off to roam around the city. Bryn obviously only travels in style! Singer Lady Gaga seen leaving the Saturday Night Live after party, at Dos Caminos on November 16th in New York City. Happy to sign autographs for fans who were waiting, Gaga rocked a pretty classic look compared to her recent appearances. And we love it. 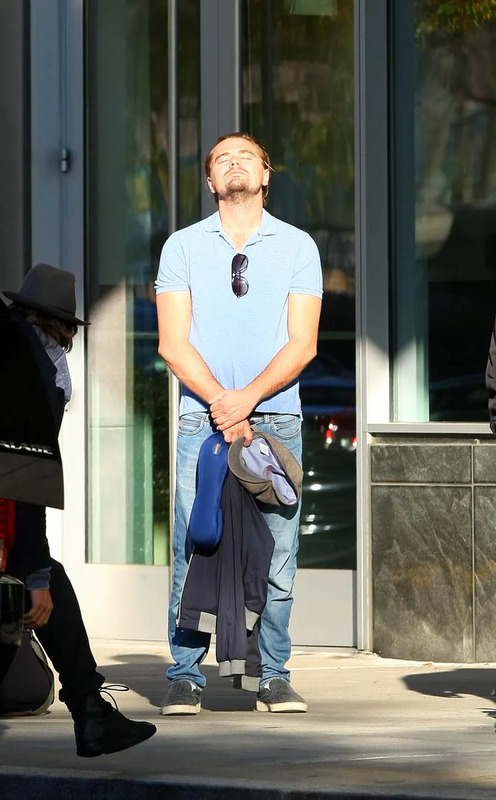 Actor Leonardo DiCaprio was spotted enjoying the sunlight while he and his friends waited on their SUV to arrive in New York City on November 16th. We kind of love this photo and thought it was too good not to share. He literally stood like this for a while. We just want to run up and attack him.. with love. 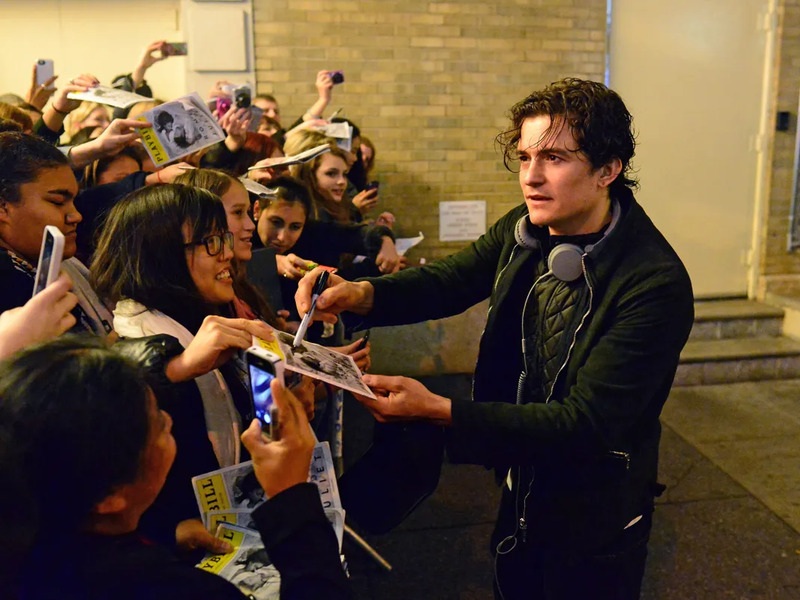 Actor Orlando Bloom met with fans outside the theater where he performed in Romeo and Juliet on November 17th in New York City. Fans were so excited to see him, that they almost knocked the barricades, as well as themselves, over. But don't worry, Romeo saved them (by holding the barricades up with his leg. What a hunk. Actress Jennifer Garner and her adorable daughter Violet out and about in Santa Monica on November 16th. Although we don't know the real reason they were both running, they're rocking the same smile so we approve. Actor John Goodman at the Handprint and Footprint ceremony held at the TCL Chinese Theatre in Hollywood on November 14th. We think he's a little excited for these prints, but it's about time! This should've happened after his role as Fred in the 1994 classic The Flintstones. Forever our favorite. Singer Taylor Swift performing at the 2013 Victoria's Secret Fashion Show on November 13th in New York City. Rocking a full Brit inspired outfit, we're sure her famous One Direction ex, Harry Styles, would completely approve of this getup. We can't wait to watch her performance during this years show! 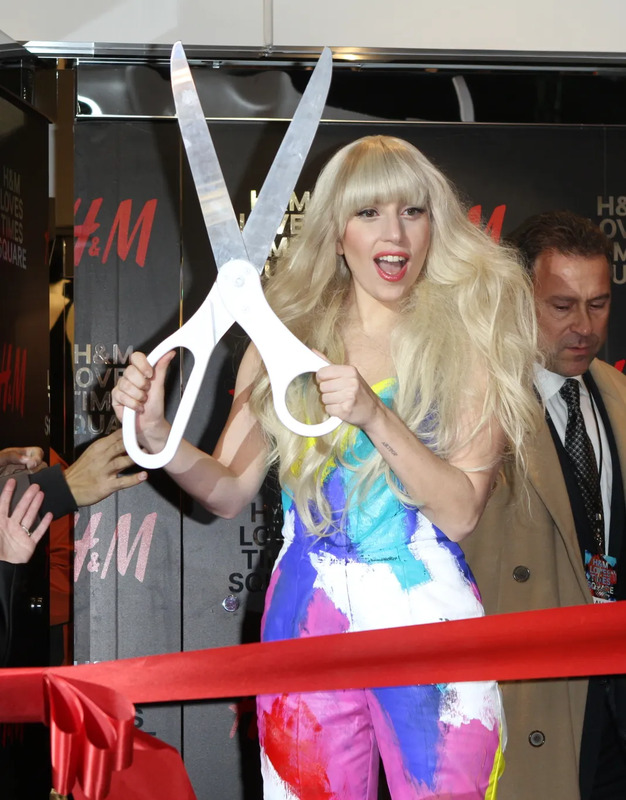 Singer Lady Gaga cuts the ribbon for the H&M Store in Times Square on November 13th in New York City. Keeping it a bit more modest than normal, Gaga was seen only wearing her popular long blonde wig, and a multi-colored jumpsuit. She really can pull of anything. Model Cara Delevingne backstage at the Victoria's Secret Fashion Show at the Lexington Armory on November 13th in New York City. Literally she might be our favorite "Angel". We love how she doesn't take herself seriously, and how she still looks gorgeous while making those faces. Teach us your ways Cara! Actress Elizabeth Banks is all smiles at the premiere of Hunger Games: Catching Fire at Cinestar am Potsdamer Platz movie theatre in Berlin, Germany on November 12th. Posing with fans, Elizabeth looked absolutely gorgeous. We wish we were her. Actress Cameron Diaz was spotted being over-the-top excited on a balcony while filming a scene for Annie in Harlem, New York on November 12th. This was her first day on set for the film, so clearly she was having the time of her life. Side Note: We're pretty positive this woman doesn't age. Model Miranda Kerr arrives at Narita International Airport in Japan on November 12th. Looking absolutely adorable, Miranda was greeted by fans, and posed for some photos. We also love the "photobomber" in the back. Naomi Watts took her kids Samuel Kai Schreiber and Alexander Pete Schreiber to school in the East Village in New York City on November 12th. With it being the first snowfall of the season, the boys spent their time trying to catch snowflakes on their tongues while Naomi just tried staying warm. Adorableness. Actress Alyson Hannigan gets a little mad at a parking meter in Los Angeles on November 12th. She then forgot her sunglasses at Paper Source and when she returned, she bought a holiday door mat that read There's no place like Gnome. Everything happens for a reason. Singer Miley Cyrus went to the BBC Radio 1 studios in London on November 11th. She swung outside to greet fans with autographs and photos, where she used her signature pose. We have a feeling this can't and won't stop anytime soon. Do you get what we did there? Singer Lady Gaga was seen wearing one of her usual extravagant outfits with huge pearl heels on the way to the Glamour Awards on November 11th in New York City. We've gotta admit though, if those shoes were a few inches shorter, we'd probably buy them. Until we sprain our ankles. Then we'll go back to being questionable about them. Nick Carter, AJ McLean, Howie Dorough, Brian Littrell and Kevin Richardson, from the boyband the Backstreet Boys, visited the El Hormiguero TV show in Madrid, Spain on November 11th. They're so gosh darn adorable. Mario Lopez seen at the Wings of Inspiration Veteran's Day skydiving event on November 11th in Los Angeles. Showing off those iconic dimples, Mario wasn't showing any bit of fear on his way back down to earth. 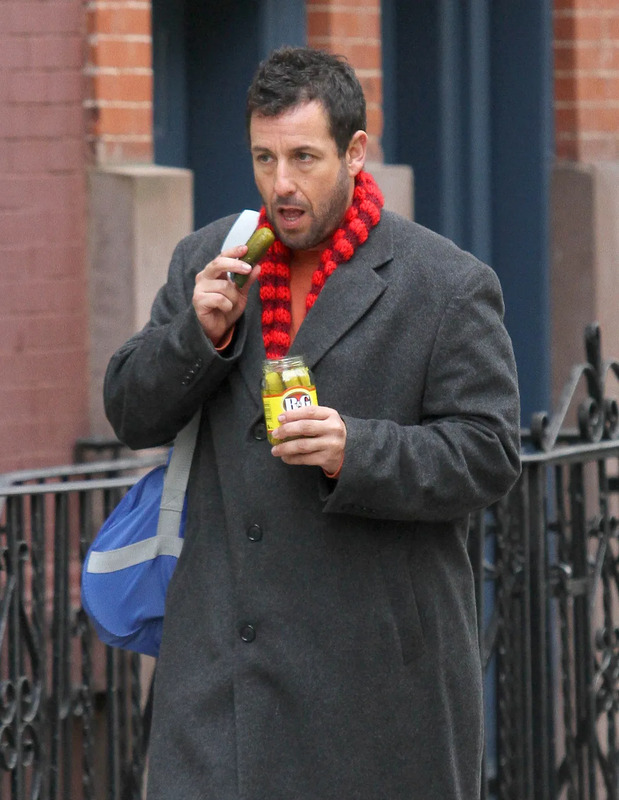 Actor Adam Sandler enjoys a pickle on the set of "The Cobbler" in the West Village in New York City on November 11th. Not quite sure, but we're pretty positive this was during downtime. Which means Adam was casually carrying around a jar of pickles, and eating them. He's our hero. Singer Katy Perry posing with her very own moonman after a win at the 20th MTV Europe Music Awards held at Ziggo Dome in Amsterdam on November 10th. Winning Best Female Artist, Katy also stole the show with her performance of Unconditionally. But really, it was absolutely perfect. 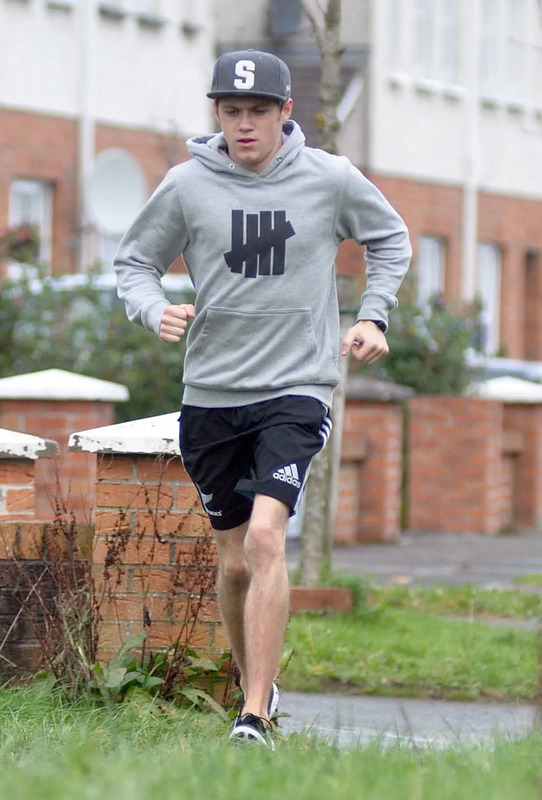 Singer Niall Horan, 1/5th of the group One Direction, was out jogging around his neighborhood in Mullingar, Ireland on November 10th. When he returned back to his house, he posed for photographs with fans who were waiting. What a sweetie. Singer Selena Gomez performed during her 2013 Stars Dance Tour on November 10th in Las Vegas. Alongside her on this tour are special guests Emblem3 and Christina Grimmie. All smiles, Selena looked stunning mid-performance. Heidi Klum attended her kids soccer game on November 10th in Los Angeles. Her kiddies won medals for the season and she and her boyfriend Martin spent their time cheering them on. We wish we had Heidi cheering us on during our daily life. Actress Ashley Greene took a trip to the grocery store on November 7th in Los Angeles. Leaving with some pretty awesome Patrick Star and Pikachu balloons, it also looks like she had an admirer. Kinda creepy, but this fireman is pretty much what completes this photo. Actress Kate Walsh traded in her boots for nail salon flip-flops after a relaxing pedicure on November 7th in Los Angeles. Based off her reaction, we're assuming someone was poking fun at her. It's okay Kate, we fully understand your actions. Singer Max George, member of The Wanted, was not so discretely admiring Maria Menounos' behind while being interviewed for Extra. This photo was basically perfect timing, but we don't blame him. It's okay Max, we understand your admiration. Singer Rihanna was spotted on a beach in Barbados on November 6th. Looking flawless as usually, she was even jet-skiing solo. We wish we looked as good as she does after a long day in the sun. Doesn't everyone and their dogs do this? 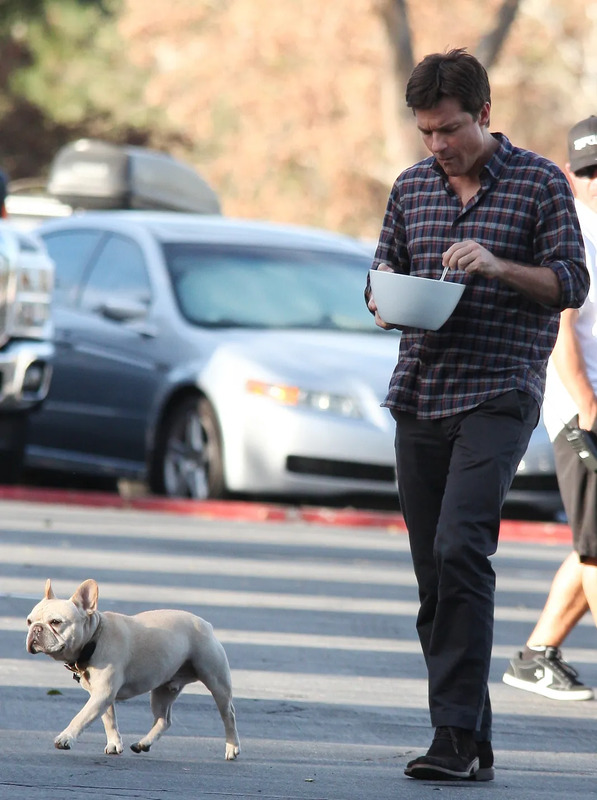 Actor Jason Bateman walked around eating while his dog walked alongside on the set of Horrible Bosses 2 on November 6th in Los Angeles. We love how casual this photo is. Also, that's a huge bowl. Actress Jane Lynch was the victim of a wonderful “photobomb” courtesy of a construction worker in SoHo, New York City on November 5th. We’re sure Jane does her fair share of “photobombing” herself, so we’re happy that it was captured when the tables were turned on her. Actor Brant Daugherty and his dance partner Peta Murgatoyd stepped out for coffee and took photos with fans on November 5th. Eliminated from this weeks episode of Dancing With The Stars, these two appeared on Good Morning America to talk about their journey and rumors about them being more than friends. 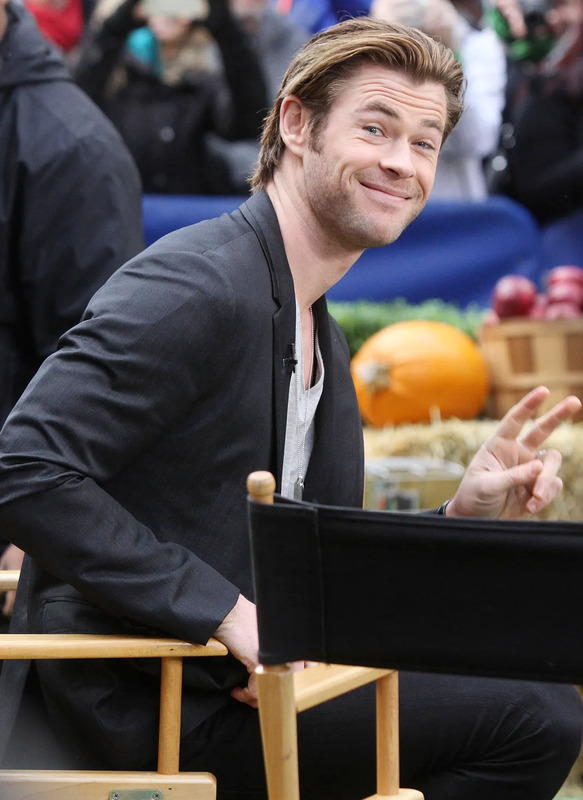 Actor Chris Hemsworth spent his morning at Good Morning America on November 5th in New York City. He made his rounds at the morning shows to promote his upcoming movie Thor: The Dark World, which hits theaters this weekend! 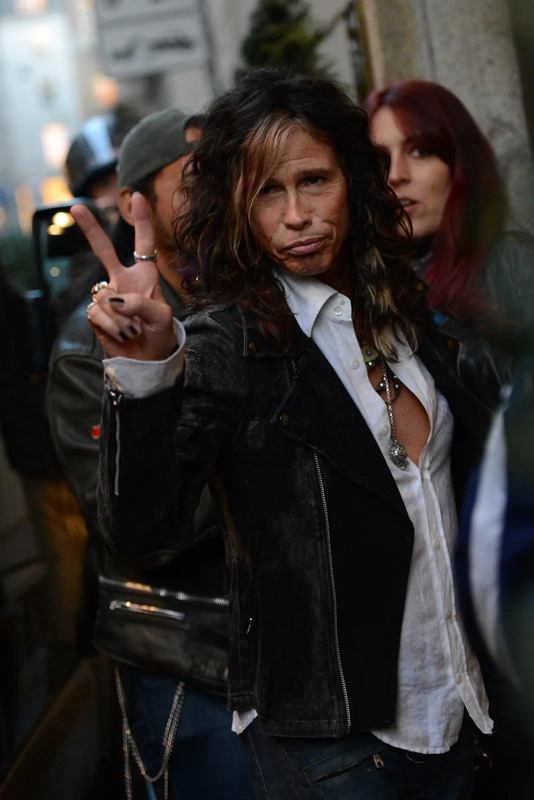 Steven Tyler out and about as he took part in the EICMA Motorcycle Festival on November 5th in Milan, Italy. This is just an all around, fabulous pose. Especially from a man, and especially when that man is Steven Tyler. You keep working that pout! 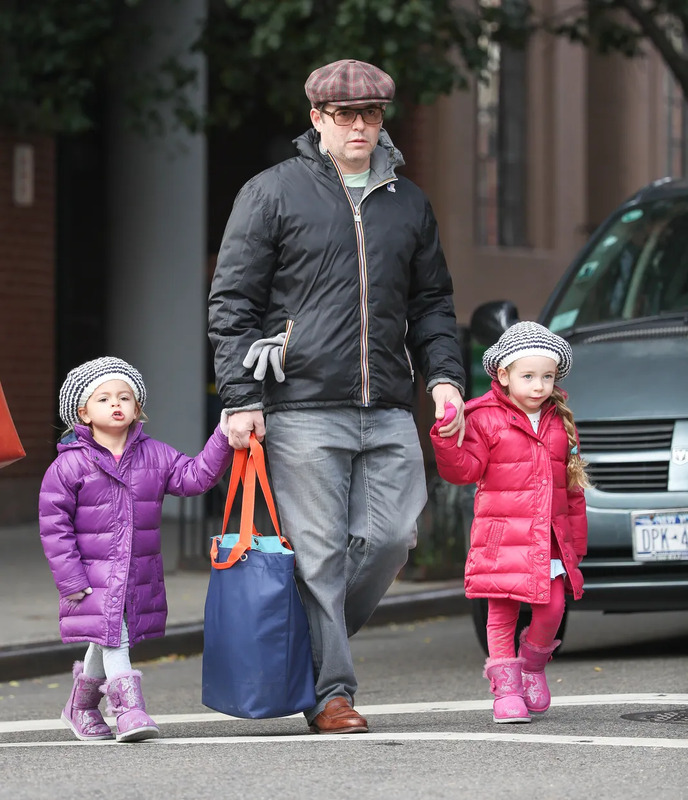 Actor Matthew Broderick and his adorable daughters, Marion and Tabitha, walked to school together on November 5th in New York City. Hand-in-hand, this trio looked precious. The girls wore matching outfits, as usual, and we love it, as usual. 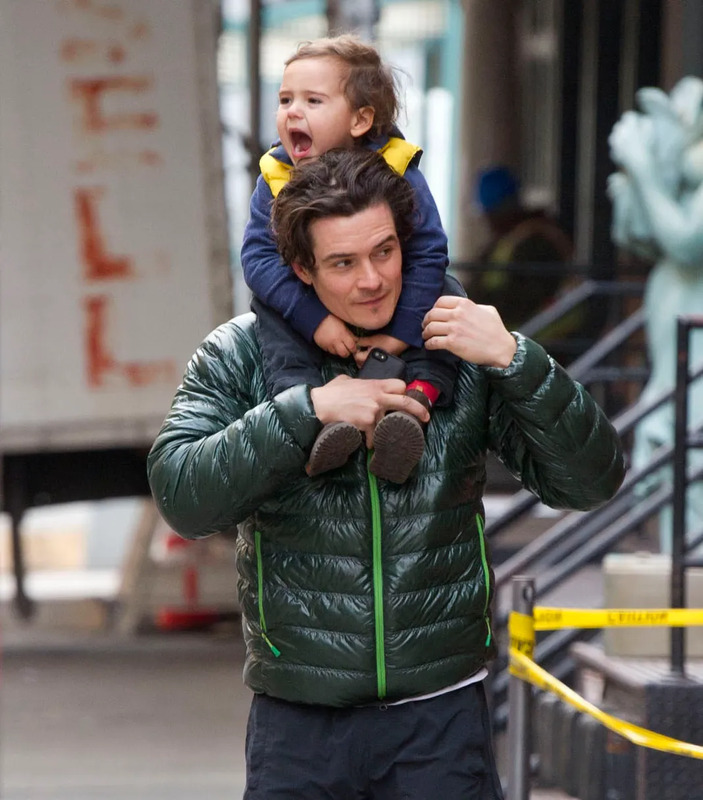 Actor Orlando Bloom with his son Flynn out for a walk downtown on November 5th in New York City. Seriously though, look at that face. We love seeing these two boys together so expect many more adorable Bloom boys photos to be posted. 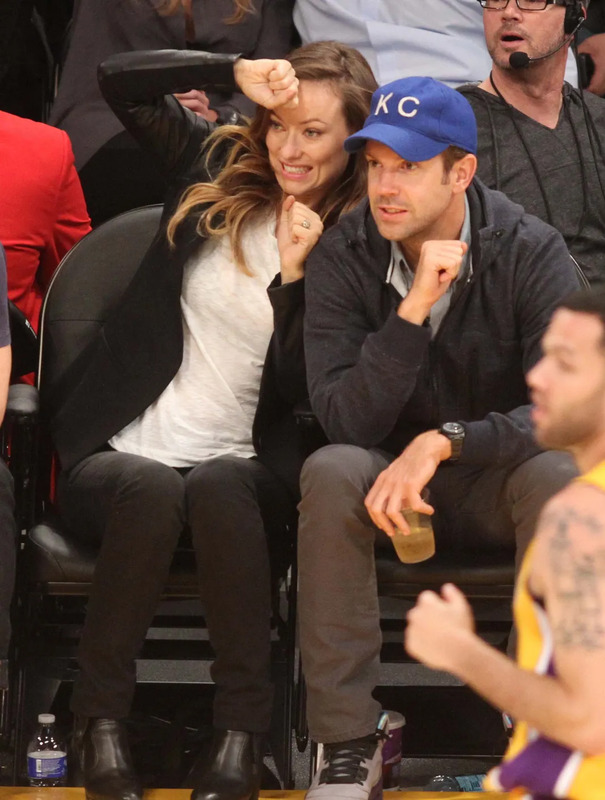 Olivia Wilde and Jason Sudeikis had a nice date night to the Lakers game at Staples Center on November 1st in Los Angeles. You could say they were pretty expressive in their reactions to the game. And we love that Olivia is the more dramatic one. Bill and Sookie have kids?! 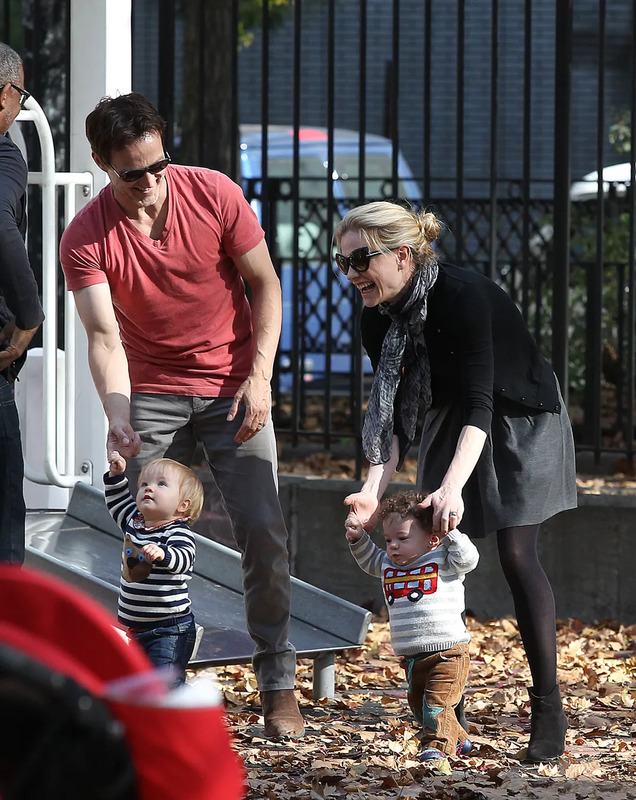 Real life True Blood couple, Anna Paquin and Stephen Moyer, took their two twins, Charlie and Poppy, to a playground in the East Village on November 2nd in New York City. We love seeing photos of them out of character because we honestly forget they have actual lives outside of the show. And then we get happy because we love them together. Actor Charlie Hunnam made a pit stop while out riding his Harley-Davidson in West Hollywood on November 3rd. Even making faces, he still look absolutely perfect. And we wish he was still playing Christian Grey but we'll survive. Or try to at least. Heidi Klum took her family to Disneyland in Anaheim, California on November 3rd. All wearing blue and going on easily every single ride in the park, Heidi still manages to look flawless. Please tell us your secrets. So are scooters the new "thing"? 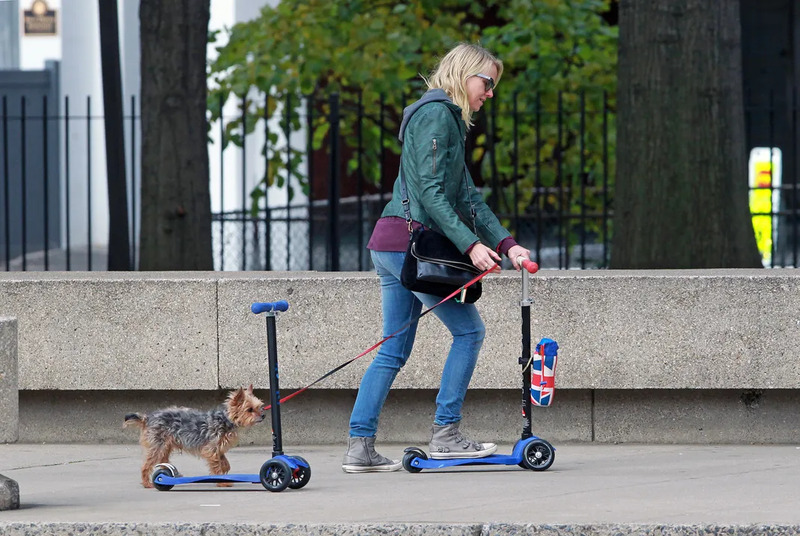 Actress Naomi Watts rode a scooter while walking her dog in the East Village on November 3rd in New York City. Another form of illusion like last months photo of Bruno Mars, we had to do a double take because we thought the dog had a scooter also. Although that would be quite impressive. Make it happen Naomi!